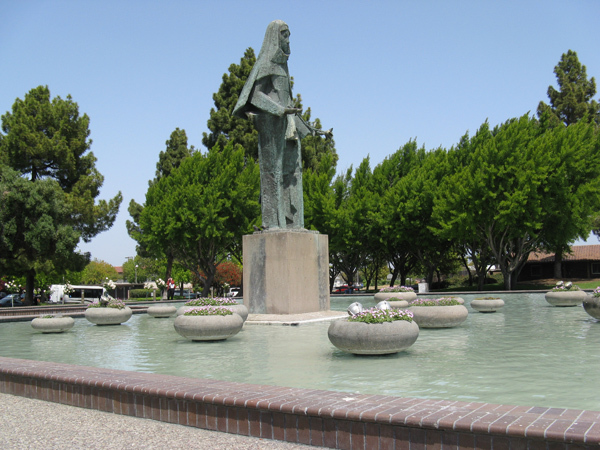 A collaborative effort between Royston and Santa Clara Parks and Recreation Director Earl Carmichael, the 3-acre site was designed in 1964 to connect El Camino Real highway with the recently opened civic center. 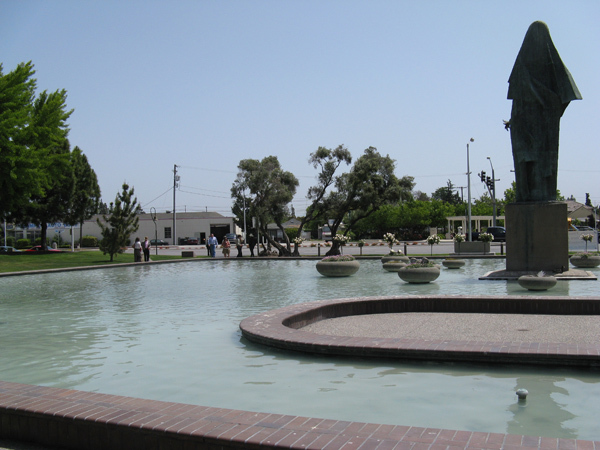 The plaza is largely paved, with a planted perimeter of mostly lawn and trees which serve as a buffer. The majority of the site is occupied by two rectangular pools with gracefully curved corners, which sit adjacent to each other at near-ground level. 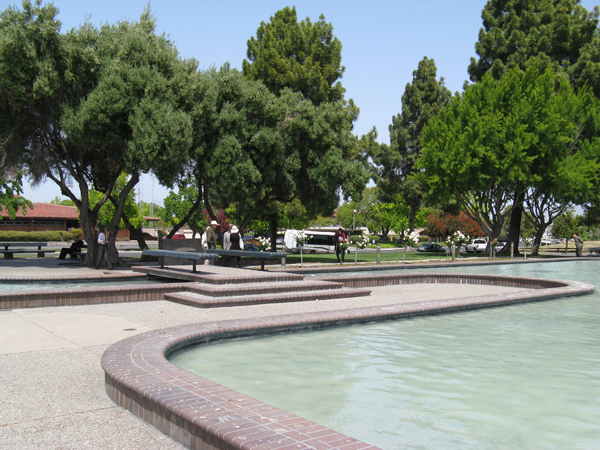 The pools are each aerated by a spray fountain and are joined together by a narrow band of water, which is bridged by a wide, concrete, stepped footbridge. 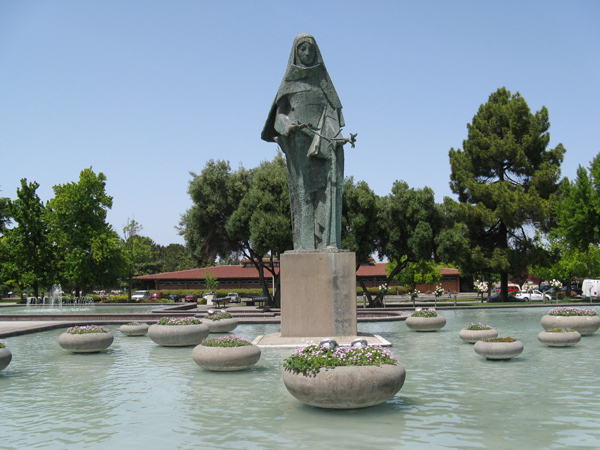 A 20-foot bronze sculpture of Saint Clare by Anne Van Kleeck is the dominant focal element of the composition, with 14 circular planters situated around the sculpture’s base that seem to float on the water. A generous concrete pathway provides access to the pools’ edges and circulation around them. 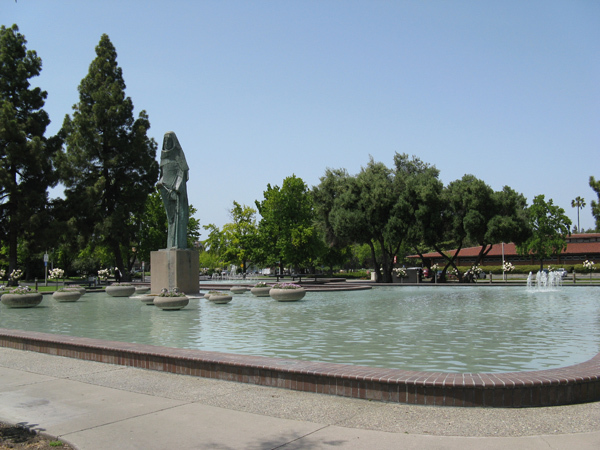 Outside the plaza, the grounds include a lawn with wisteria that serves as an outdoor theatre and several seating areas shaded by bosques of Mediterranean stone pine, ginkgo, and sweetgum. Olive trees symbolize the agricultural groves that were once planted in the region.